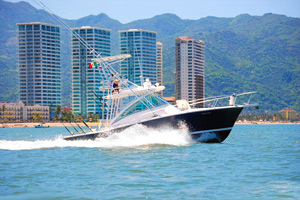 Sport fishing in Puerto Vallarta offers flexible and affordable open sea options, whether you want to go fishing for a few hours or most of the day. Boats available for fishing in Puerto Vallarta are usually fitted up with a living area, a kitchenette, fishing rods, a fish tracker and everything you need for a comfortable experience. •Fishing is abundant throughout the year, with plenty of sailfish from November through May. •After your big catch, you can ask the boat crew to help prepare your fish on board. •You can also take a certain amount of fish back to your hotel in Puerto Vallarta. The concierge or head waiter can ask the chef to prepare your fish for dinner. •For fishing in Mexico, you will need a federal license that can be obtained directly at the beginning of your Puerto Vallarta fishing tour. If you have a fishing license from the USA or Canada, it will also be considered valid. 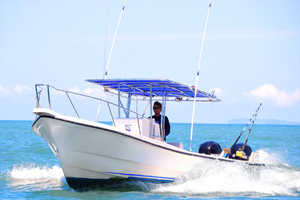 •If you're looking for an inexpensive fishing tour in Puerto Vallarta, try fishing on a super panga. These versatile, well-equipped boats are perfect for fishing in the bay. •Most fishing tours in Puerto Vallarta include bait, a bilingual crew and various fishing lines so you can fully enjoy your day. If you've never tried open sea fishing, you'll be surprised by how relaxing this activity can be thanks to the majestic scenery of Puerto Vallarta. Even kids will love a fishing tour on Banderas Bay, a great way to bond with the family. Don't miss it!